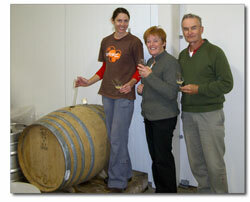 The cultivation of Croft Wines has been a journey of the heart. The seed of what is Croft Wines today began in 1997 as the search for a family holiday home for Peter and May Croft, and their children Hannah and James. Like many others, the Crofts were chasing a dream of the perfect holiday retreat offering relaxation and perhaps an opportunity to enjoy their own wine. A property nestled amongst the vines in Kitchener Street – now the cellar door – offered both the ideal respite from busy lives and a little space to indulge their burgeoning passion for wine. That passion soon outstripped the boundaries of one acre and the 468 vines the Kitchener Street section could support. So, two years later, in 1999, another search began. The Crofts scoured many options: some properties were too big, some too developed, others were too far way or lacked the right soil. After being gazumped on a 20-acre section that seemed to fit the bill, the Crofts finally settled on a 25-acre Pirinoa Road block, a site they purchased once vetted and approved by a soil expert. With a vineyard development plan in place and an experienced horticulturalist – Nick Thornton – on board, so began the life of Croft Wines. An initial planting of Pinot Noir was quickly followed by Chardonnay, Pinot Gris and Sauvignon Blanc, all varieties produced by the winery today.